Ants | Infonet Biovision Home. Bedford ECG, de Villiers EA. Courtesy of Ecoport www.ecoport.org. 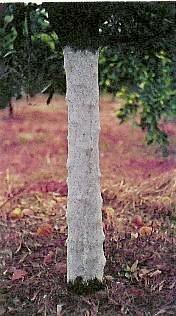 Certain ants are major indirect pests in citrus orchards. Although they do not damage the trees, they are associated to honeydew-producing insects such as soft scales, aphids, whiteflies, blackflies and mealybugs. Natural enemies often keep these insects under control; however, ants feeding on the honeydew give them indirect protection by disturbing natural enemies. As a result numbers of these honeydew producing insects, and indirectly other pests such as armoured scales, may rise to damaging levels. Ant management does not imply eradication of all ants. There are many different types of ants in citrus orchards. Many of them are important predators of other insects, including pests of citrus. Some of the species that could be a problem due to their association with honeydew-producing insects (e.g. the big headed ant Pheidole megacephala and the pugnacious ant, Anoplolepis custodiens are also beneficial preying on a variety of insects, and are valuable predators on the ground. Therefore these ants should not be destroyed but kept off the trees. 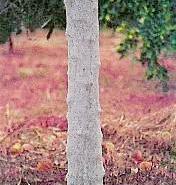 Undesirable ants can be kept out of the citrus trees by banding the stems with sticky stripes, or by spraying the tree trunks with insecticides. To keep these ants out of the trees low branches on the tree must be pruned and all weeds that touch the canopy must be removed, so that they do not provide access to the tree for the ants. When using sticky bands, they must circle completely around the stem. In addition, they should be checked regularly for efficiency. Sticky bands (strips) soon become non-adhesive in dusty and windy conditions. Moreover, over time insects get stuck to the bands clogging them and forming bridges, which the ants can cross. Therefore regular applications of the sticky substances are needed. Sticky substances (e.g. grease) may burn the bark, particularly, in young trees under direct sunlight. Therefore, it should not be applied directly to the trunks, but using polyurethane stripes as a base.